There are two roles: the Explorer, person who speaks. And there’s the Listener. After the Explorer’s turn, the Listener becomes the Explorer. For each 15- or 20-minute turn, one person is the Explorer and the other is the Listener. Of course, there are many situations in which giving advice or suggesting solutions is very appropriate, but not in a Listening Partnership. If the Listener starts to help or give advice, it takes away some of the Explorer’s precious space. This is a very special space where there is room for you, as the Explorer, to hear yourself think. This is not about being logical. It’s about sensing whether the words that come feel right or not. If they don’t totally feel right, then you, as the Explorer, can keep on exploring. You welcome those moments when words seem to fail you. Of course, it can feel weird or troubling. It’s like you’re in the twilight zone, instead of the bright sunlight where everything is sharply defined. But being in that twilight zone, noticing the feeling without the words, actually stimulates your mind to go deeper. You will get better at it with practice! 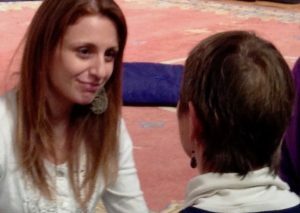 If you’d like more guidance, sign up for a Focusing class!